(Bloomberg) -- A sweeping package of climate-change measures unveiled Thursday by Representative Alexandria Ocasio-Cortez drew a tepid response from House Speaker Nancy Pelosi, who didn't explicitly throw her support behind the ideas. The proposals, known as the Green New Deal, were crafted in conjunction with Senator Ed Markey of Massachusetts. The Democrats' plan envisions shifting away from fossil fuels and other sources of emissions that cause global warming within 10 years. "We welcome the enthusiasm that is there with the Green New Deal," Pelosi said Thursday at a news conference. "Quite frankly I haven't seen it, but I do know it's enthusiastic, and we welcome all the enthusiasms that are out there." Pelosi described the proposals as one among many to address climate change, emphasizing the urgency of the issue while highlighting the work that existing committees have also begun. 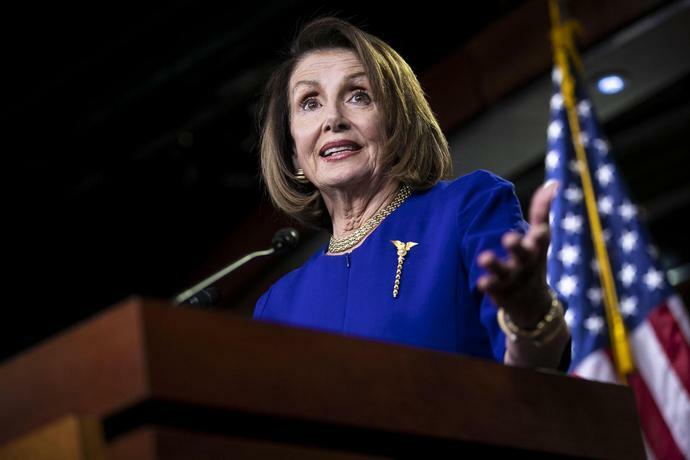 "The public is much more aware of the challenge that we face and that is a good thing," said Pelosi, a California Democrat. A fact sheet on the plan distributed by Ocasio-Cortez's office called for moving away from nuclear power, which some climate activists favor as a carbon-free energy source. However, Markey said at a separate news conference Thursday that the resolution doesn't address specific energy technologies. Language on nuclear power "is not part of this legislation," he said. "The resolution is silent on any individual technology that can move us to a solution." The plan has already gathered 60 co-sponsors in the House and has prompted strong opposition from Republicans and industry leaders who say it's technologically impossible and would costs tens of trillions of dollars. Advocating for stronger environmental laws has been an important part of the agenda of Ocasio-Cortez of New York and other progressives in the new Congress. Hundreds of young activists stormed Pelosi's office after Democrats won the House in November and were briefly joined by Ocasio-Cortez in a live-streamed protest to demand passage of a radical plan to fight climate change. "Today is the day that we truly embark on a comprehensive agenda of economic, social and racial justice in the United States of America," Ocasio-Cortez said at the press conference with Markey and other supporters. "That's what this agenda is all about, because climate change and our environmental challenges are one of the biggest existential threats to our way of life, not just as a nation but as a world." When asked about Pelosi keeping a bit of distance from the plan, Ocasio-Cortez insisted that Democrats are united in their effort to address climate change, and she appreciates Pelosi's leadership on the issue. "We are in this together," Ocasio-Cortez told reporters. "We are not going to get divided." The proposal has little chance of gaining support in the Republican-controlled Senate, let alone being signed into law by President Donald Trump, but has become a rallying cry among some liberals and a lightning rod among conservatives. "The Green New Deal is a raw deal for the American taxpayer," said Wyoming Republican Senator John Barrasso, chairman of the Senate Environment and Public Works Committee. "As Democrats take a hard left turn, this radical proposal would take our growing economy off the cliff and our nation into bankruptcy. It's the first step down a dark path to socialism." --With assistance from Jennifer A. Dlouhy.